When I went to Solsona, I initially visited their public market. I landed at the second floor. There I saw vendors who sell some exotic foods. It was fun talking to most of them. They warmly showed me the food products they sell. I have seen the dried venison or daing nga ugsa. A bundle of it costs Php350.00. The deer’s antler or horn for display cost Php500.00. 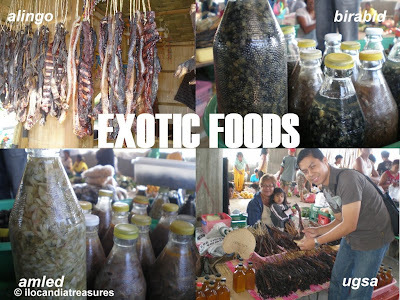 Birabid, a salted shellfood taken from the riverbeds costs Php150 per small bottle while if its unshelled cost Php300. Amled is a type of small fish which was also salted sold it for Php300. This originates from the town of Carasi and taken from the river. As I went around the area I was surprised to see ararawan or crickets which are not yet in season. These are taken from the ricefields. Usually they appear during rainy season. It is a little expensive when not in season. 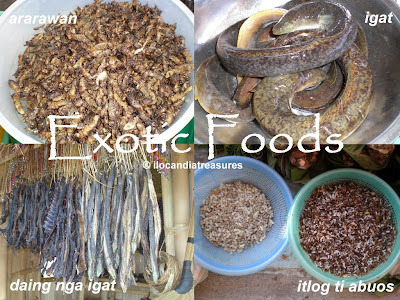 Another exotic food I saw was the red ant’s eggs or itlog ti abuos. They sell it in pure eggs or mixed with some ants. I have seen dried meat of wild pig or alingo and the dried eel or daing nga igat from the gameng village. I have first tried the venison cooked as lauya in the same town in the same first visit. I love the taste. Whereas my first try of the wild pig or alingo was in Adams cooked as adobo. It was much tastier than the ordinary pork. I use to cook itlog ti abuos since many of it are sold at the Laoag market on Sundays of summer where I buy just a small portion. I just sautee it in garlic, onions and tomatoes and presto. I cook it also as an omellete where I beat a chicken egg and add this ant’s eggs.